Results for the year ended 30 June 2003. 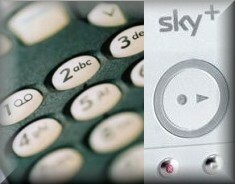 At 30 June 2003, there were 105,000 subscribers to Sky+ representing an increase of 77,000 in the year, successfully achieving Skys target of having 100,000 subscribers by 30 June 2003. Sky+ enhances Skys reputation for innovation and continues to lead the growing Personal Video Recorder category in the UK. The early evidence is that Sky+ customers demonstrate encouraging levels of customer loyalty and a high propensity to subscribe to top-tier packages. In addition, at 30 June 2003, there were 165,000 subscribers to the Extra Digibox representing 111,000 net additions during the year. Approximately 57% of Sky+ subscribers are also Extra Digibox subscribers. The article also reports that 3 new Sky+ boxes will be launched from October, in time for the busy Christmas sales push. Lots of information there from the Sky source, how much of it is accurate, we can but wait and see. BSkyB has chosen interactive design consultancy Digit to design and build a web site for its digital video recorder and satellite receiver Sky+. It will launch in the autumn as part of an integrated campaign. BSkyB has launched its digital television recorder, Sky+, in Ireland. The Personal Television Recorder and Service allows recording without a video recorder, pause and fast-forward live TV and can automatically record episodes of favourite series. The system offers 20 hours of recording space. The Sky+ set top box will cost EUR399 and the subscription is EUR15 per month. Sky's existing digital subscribers will pay EUR75 for standard installation of the equipment. Editor's Note: Apologies to our Irish readers for getting info on the release date wrong last month - the erroneous "news" was sourced direct from Sky's PR firm. Anyway the official blurb above sounds plausible. If any our Irish readers would care to write a review of the machine and the Irish service, channels & Series Link coverage, we would be delighted to feature such an article. Sometimes in the world of Sky+, it's as much as what's not said as what is. A case in point being today's End of Year report from Pace. In the UK, BSkyB continued to add to its subscriber base and the Sky+ PVR increased its penetration. Gross margin for the year declined to 20.9% (2002: 22.7%). Performance improved significantly during the year, with a second half margin of 29.1%. This improvement was due to a number of factors, not all of which can be assumed to be recurring at the same level, such as income from a number of one-off engineering projects. However, the growth in deployment of Sky+ is now generating a regular monthly income. " In what's turning out to be a great day for Five, who are now using Series Links, Plusworld has noticed even better news. As Five tend to show quite a few films, they have used common sense and implemented the Link for the 1st part of the film before it is interrupted by 5 mins of news, and then it concludes afterwards. e.g. Although this may not sound like ground breaking news, theres has been numerous reports of viewers missing the 2nd part of films on other channels because it was interrupted by the news, and of course this can always be missed by the human eye. Considering Five have been using links for less than 24hrs Plusworld thinks they deserve a pat on the back for making Sky + users recording of films that bit easier. With the sound of our recent report concluding "must do better" still ringing in their ears, Five have risen to the challenge and introduced Series Links for their channel. Viewers checking the Electronic Programme Guide today would be pleasantly surprised to find that many of next week programmes are now Series Linked, including popular shows such as Terry & Gabby, Family Affairs, The Shield and many others. Plusworld is pleased to report that all the 5 main channels 101-105 are now using Series Link, to a greater or lesser extent. Congratulations to Five for listening to the viewers, and thank you. With the start of the month upon us, the special offer valid until 30th June has ended. Customers logging on to the Sky.com web site today, were greeted to the not so special offer of Sky+ for £249, although to be fair to Sky they had kept the low installation price of £1. Plusworld reckons the thinking behind this is that the autumn mega marketing push isn't that far away, and Sky need to have Sky+ at the higher price for a time, before they reintroduce their latest "special offer" of a "cheaper" Sky+. Over the last weekend many more Sky+ new cards have been received by Sky+ subscribers. However analysing a straw poll at Digital Spy Discussion Forum, there still seems to be many Sky+ customers who have yet to receive their new Sky+ card. To save confusion we have placed images of the letter & instructions online that were received at "Plusworld Towers". After alerting Sky to the old terms and conditions not being updated to reflect the new offer, Plusworld is pleased to see that the new T&Cs have now been placed online for all to see. 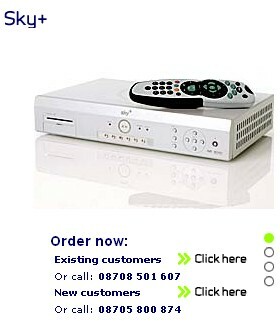 Customers logging on to the Sky.com web site today, will see that the offer only mentions online terms & conditions. If you need to phone Sky Customer Services one would hope that the same offer could be had by speaking to someone over the telephone. Sky+ is only compatible with digital satellite. To use the Personal Video Recorder features of Sky+ you need a Sky+ subscription. Minimum Sky+ subscription 12 months, charges payable by direct debit or credit card only. Eligibility is subject to status. You will need Sky+ professionally installed even if you already have a minidish. You must keep your Sky+ box connected to a fixed and operational telephone line for at least 12 months. Standard Sky+ installation is £1 (usually £50) if you order online for both existing and new Sky digital subscribers (£100 for non-subscribers). Additional charges may apply for non-standard installation. You will be advised of the charges for this before installation. If you need a minidish you are responsible for obtaining all consents required e.g. landlord's consent before installation. Further terms and conditions apply. Prices and information only applicable to residential customers aged 18 or over in the UK, Channel Islands and Isle of Man. Sky have finally "bitten the bullet" of reducing the install Sky+ price for all. Customers logging on to the Sky.com web site today, were greeted to the special offer, and though not specifically made clear, the wording of the advert, made the Sky+ installation at £1, sound as if it was the new permanent install price. E-commerce has been recently introduced on Sky's web site, allowing customers to order Sky & Sky+ products, even allowing customers to choose a suitable installation date at their home. Customer Graham Thompson was happy to use the secure transaction of the Sky web service and received all the correct notifications to tell him that his order had been successful. 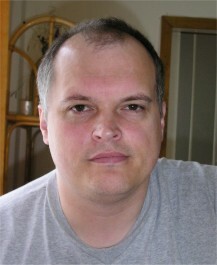 He even received e-mail confirmation and payment was subsequently debited from his card. "A word of warning to all customers thinking of ordering a Skyplus box - do not order it through Sky's website. I placed my order on 29th May 2003 with an install date of 6th June 2003 - the order was quickly followed with an email confirming the install date and three days later written confirmation and a large debit from my Credit Card. So the 6th June came and no sign of an engineer (or a comforting phone call giving approx time for install) with a shiny Sky Plus box, so I had the arduous task of phoning Sky. After half-an-hour of paying to listen to Sky's telephone ads a representative answered and I was told that my order had mysteriously disappeared (strange how it didn't disappear before the debit from my Credit Card) and sorry!. So I cancelled the Sky Plus order and will now have to wait two weeks for a refund and I am so angry at the moment I'll probably cancel Sky altogether and got to Telewest. " "Thank you for highlighting this incident . The Sky+ online ordering service has been available for almost one month now and since launch we have had hundreds of orders processed successfully. This is an isolated incident but one we take seriously. Could you please forward Mr Thomson's contact details and someone from Sky will give him a call direct to resolve the issue." "I just received a phone call from Sky - they gave me a credit of £38 for my troubles (after asking me if I was going up to the full package, this was offered as one months free viewing without the £10 Sky Plus supplement). I've basically ran out of steam and my wife urged me to accept the offer so it looks like I'll just have to accept it . You might want to warn people on your website of this cautionary tale for all users tempted to use the Sky website to order Sky plus. I think that all users ordering Sky plus from Sky's website should backup the order with a phone call to Sky to get at least an install booking number and don't trust automatic responses generated by Sky's website. Once again thanks for your efforts at Plusworld. " After a catalogue of recording failures due to Sky Series Link not working correctly on BBC1, Plusworld decided to write to the BBC to ask what was going on. We picked on one programme so as not to cause confusion - with a simple question - what's going on? See the e-mail below with the BBC's reply. Why do Sky Series Link not work properly for HIGNFY? The show has a Series Link, but out of the last 4 weeks, it has only series linked correctly once. Please can you explain why this is? It makes my Sky+ system unable to record the programme automatically as it should. 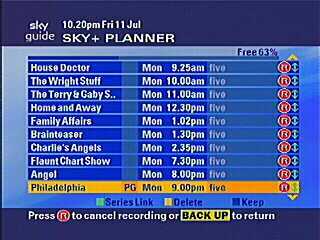 This has happened for all users of Sky+ and must be a BBC problem as you control the EPG for BBC1. Please can you investigate and rectify this fault? Our apologies, the linking code for this programme was double entered, thus causing problems. You should deselect it, and then reselect it, and normal function should then be restored. Just as well customers in the Republic of Ireland are good at waiting. Because the long anticipated launch of the Sky+ service there is going to be delayed a little longer. Sky were asked by Plusworld when Sky+ was going to be available: "late summer/early autumn" was the response. 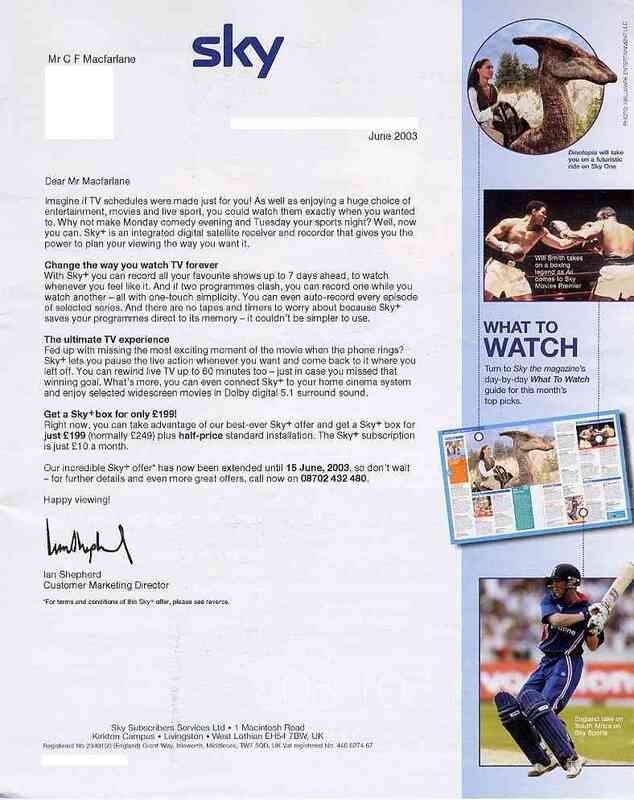 Long standing Sky+ subscribers received a letter in the last week from Sky Customer Marketing Director Ian Shepherd. He invited them to show their Sky+ off to their friends and let their friends know about the Sky current offer on Sky+. The deal entails that for every new friend that you sign up for Sky+, you get a £50 Marks & Spencer voucher & a Free Sky Gamepad 2- player starter pack. A report in today's Media Guardian indicates that Sky are to launch a new service for Sky+ that will allow you to select a programme to record using your mobile phone. So there you have it from Sky, Media Guardian appear to be crystal ball gazing a little too much, at the moment anyway. 1) Is it just mobile phones - either text message or WAP? 2) Is it a Premium Rate service e.g. £1.50 a text, or a similar amount per minute? 3) Will you be able to do other things like check the status of a recording e.g. to check that it has successfully recorded. Interestingly there was no word on a Web service along similar lines to the mobile service. Further details on this story when further information becomes available. Media Guardian report - This Time Will It Fly? Sky have sent out their Sky Customer Magazine for June to Sky subscribers with a covering letter inviting them to take part in a special offer for their Sky+ system. As usual the covering letter was written by Ian Shepherd, Sky Marketing Director. The offer was Sky+ for £199 plus £25 standard installation, plus £10 per month Sky+ subscription charge. If you don't want to subscribe to Sky Digital, installation is still £100! 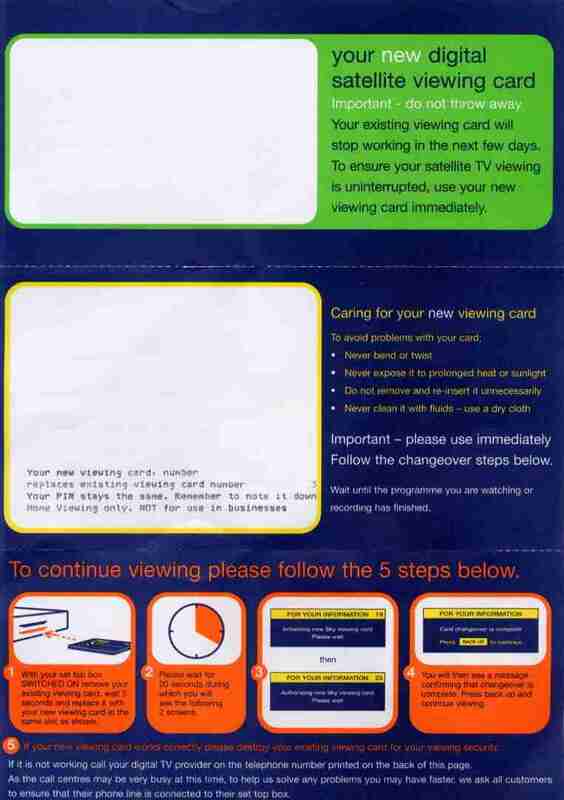 Sky didn't cross check their database to see who already had their Sky+ system & subscription. 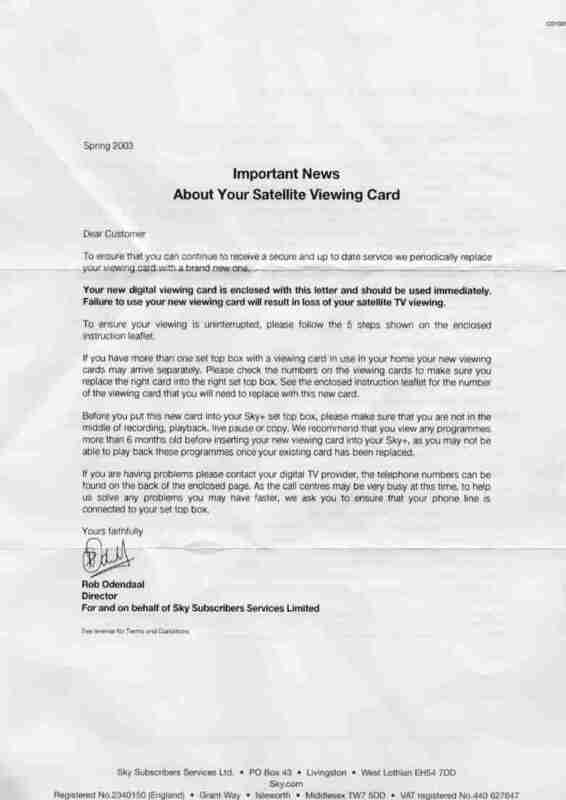 As Sky+ owners still received the letter. Sky are to push their Sky+ publicity machine into overdrive over the coming few months in a multi million pound advertising campaign to the general public . The website PVRUK gives details from Europemedia.net which is reporting that the major campaign is about to roll because "the time is right". Advertising agency hhcl/ red cell who recently won the high profile account for Sky+ is already working hard on the Sky+ marketing so expect a high profile "national launch" for Sky+ soon. It's the subscriiption revenue from Sky+ of £10 a month, that is pushing Sky to get from its average revenue per subscriber of £364 to a figure of £400 per subscriber - this is what the focus of the next 12 months will be on. Plusworld feels sure that there will hardly be a man or his dog that won't have heard of Sky+ this time next year. Sky updated their official Sky Publicity website with a clear promise that Dual Recording will be "coming soon". Not only was this a relief to subscribers who have been much anticipating this "killer feature", but there was also confirmation that both the original Pace version1 Sky+ box, and the newer Pace version 2 Sky+ box would both have this exciting and ground breaking new feature when the software update is released to the Sky+ boxes. And of course Plusworld will keep you up to date with all the developments on this most critical software update. Sky today made public their sales figures for Sky+ subscriptions for the period ending 31st March 2003 showing that 79,000 subscribers now have Sky+. Despite normally quiet trading conditions at the start of the year, Sky have managed an additional 14,000 Sky+ subscriptions - an increase of 21% on the previous subscription level of 65,000 recorded at 31st December 2002. Whlst this is encouraging for Sky+, these figures reflect the state of play before the recent marketing push to "loyal Sky subscribers" and the reduction of Sky+ to £199. Of course the sales push to the general public has not even started yet, (rumoured to be September). Sky have sent out Sky+ marketing packs to selected customers (on the top Sky World subscription package) inviting customers to purchase Sky+ and a mirror subscription together. Note: the pack is NOT selling a Sky+ stand-alone package. These packs consist of a black A4 Size envelope emblazoned with the new Sky+ marketing logo, a letter from Ian Shepherd, Customer Marketing Director, extolling the undoubted virtues of Sky+. What is more intriguing is the high quality, glossy booklet that explains what Sky+ is and what it can do for you. The bottom line that makes Sky claim that this is an "incredible offer" is the SKY+ SUBSCRIPTION FREE FOR LIFE (instead of £10 per month) providing that you stay permanently subscribed to their top Sky World package AND pay £15 per month for the mirror subscription. ONLY UNDER THESE TERMS WILL THE SKY+ SUB BE FREE - dial Sky on 08708 501603 and quote "Incredible" if you are interested in this specific offer. Sky are also offering special time limited deals on reduced installation charges for Sky+ & digibox relocation. Sky have also sent out Sky+ marketing reminder notices encouraging prospective customers to take advantage of this time limited offer referring to the previous marketing pack. Plusworld Opinion: This is a significant development in the way Sky market Sky+, and is a good deal if you can afford the total cost of all the equipment, installation, mirror subscription and standard subscription. However if you don't want a mirror subscription for your old digibox, or if you are not on the Sky World package then your options are limited to the standard terms and conditions which are: £199 for the Sky+ and £50 install, your normal Sky subscription plus the £10 per month Sky+ subscription. This marketing model may work for some existing Sky customers, but it will be interesting to see if this "high price" ownership appeals to all. Keep checking with Plusworld for all the latest news. Considerable effort appears to have gone into the production of the demo and the new photographs give a good taste of the kind of campaign that is to launch soon to herald the hard sell of Sky+, with its "killer application" - Dual Recording. No information on the web site indicates what happens to the price of Sky+ once this current "offer price" of £199 ends. The supply of the original version 1 boxes should now have dried up, so expect to see Sky+ version 2 in shops near you soon.